Churchill’s Family Motto: Why in Spanish? It was a journalist friend of mine, an expert in military questions, who brought my attention to Churchill’s motto, “Fiel pero Desdichado”. As we were talking in Spanish, at first I saw nothing strange, until he showed me old Winston’s coat of arms and I realized that it was in Spanish, in the original. I have to admit that it was a big surprise for me, but I decided the matter would not end there, I had to research and find the origin of the motto and the reason why it was in my beloved language. This is what I found. Escudo de armas de los Spencer Churchill. It was the same friend who told me that the origin of this curiosity stemmed from the fact that Winston Spencer Churchill, the future Prime Minister, had received his first military medal not from his own army, but from the Spanish Army, which condecorated him because of his involvement in the War of Cuba. This last part is true, young Churchill, then an officer with the 4th Hussars, asked Madrid for permission to travel to the “Faithful Island” as an observer and, once he got it, he went to Arroyo Blanco, in Sancti Spiritus province to join the staff of general Suárez Valdés. During his short stay, Churchill would end up being under fire for the first time on the 30 November 1895, on his 21st birthday. Because of his service, he would receive the Cross of Military Merit with a Red Badge. However, Winston could not have chosen his motto in Spanish due to his days in Cuba, for the simple reason that such motto was chosen centuries before by one of his most illustrious ancestors. During the English Civil Wars (1642-1659) that pitted parliamentarians versus royalists, another Winston Churchill who, in the same manner as his descendant was known as a soldier, politician and historian, supported Charles I. But when the latter lost the battle of Worcester in September 1651 and shortly after, the head, his backers were left in a difficult position, including Churchill, who lost all his titles and possessions. When the monarchy was reinstated under Charles II, he wanted to reward their loyalty, making them knights and granting them the right to bear a coat of arms, but without compensating them for their material losses. 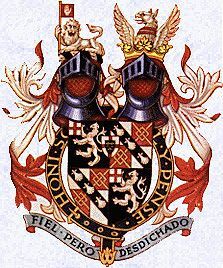 The newly named Sir Winston Churchill, father of John Churchill, the 1st Duke of Marlborough, chose the motto, “Fiel pero Desdichado” (Faithful though Unblessed). According to the theory, he did so to portray his disappointment for not being compensated. Now, why did he choose the motto in Spanish, nobody knows. The tradition is that he would have done so in Latin, in French (in the coat of arms we can also read the phrase Honi soit qui mal y pense, something like, Damned he who thinks badly of it! England’s motto), as it was done by the English descendants of William the Conqueror, or even in German, used by those with family links with Teutonic lands. But in Spanish? We are still guessing. We don’t know if the descendants of the Churchill clan keep zealously the secret, not even if they themselves know the truth. They always avoid speaking about the matter. Researchers and historians have gone to great lengths to find an answer to the riddle, to no avail. 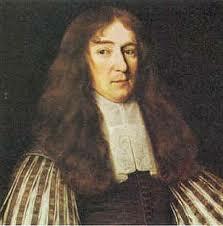 Some suggest that because Spanish was not the language of the court nor of the church, would be the most apt. Others think that it was chosen simply because it sounds better. I dare to say that, since England did not yet see Spain as its main rival, it could have been just a sign of respect and admiration of our beautiful and evolved language. Any theories among the readers? This entry was posted in Articles in English, Blog, Curiosidades, Personajes. Bookmark the permalink. ← Los soldados judíos de Hitler.